Sledge slope, beginner's ski area, snooc, ski touring...Col du Corbier is in full renewal! The Valley d'Aulps in winter from the sky: all the beauty of landscapes and an incredible range of activities covered in a 3 minutes video! 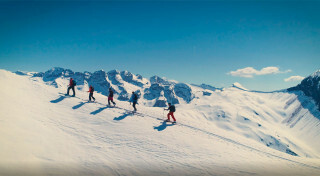 Best places to ski, useful informations, amazing views, patrimony and activities: the Winter 2019 Brochure is available. Download it! Feel like forgetting the car, to go walking or skiing without worring about the return? 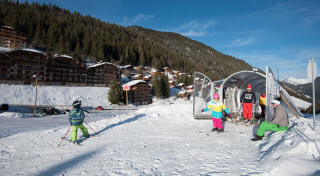 In the Vallée d'Aulps, we do our possible so that you can forget the car: Balad 'Aulps Bus is to get around in the Valley and ski-buses to reach the ski resorts! 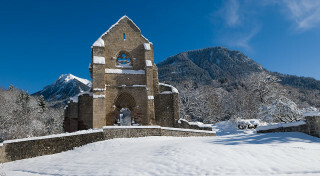 A renovated former monastic farm housing an interpretation centre with 650m² of exhibition space: displays on the monks’ daily life; links between the Abbaye d’Aulps and the Savoie; the unexpected story of its final destruction: welcome to the Aulps Abbey Dicovery Center!